The incidence of bronchiectasis is higher among females and the elderly, and symptoms suggestive of bronchiectasis should be investigated in these patient populations in particular. 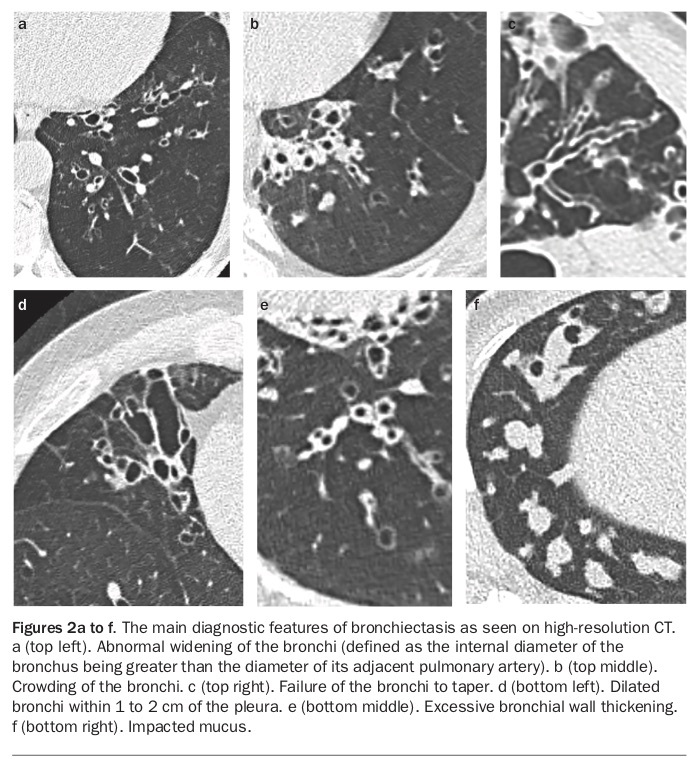 Features suggesting bronchiectasis can include persistent or recurrent productive cough; recurrent chest infections; infections that are slow to resolve and persistent chest x-ray abnormalities despite antibiotic treatment. The coexistence of COPD, asthma or other respiratory disease with prominent cough and sputum production should also raise the suspicion of bronchiectasis. Other suggestive features include haemoptysis (often streaking), cough-induced chest pain, poor nutritional status, failure of response to inhaled corticosteroids or bronchodilators in suspected asthma/ bronchitis, and recurrent sputum isolates of Haemophilus or Staphylococcus species or a single sputum isolate of Pseudomonas species or methicillin-resistant S. aureus. Clinical signs that may be found include finger clubbing, halitosis (commonly associated with anaerobic infection), hyperinflation of the chest and poor nutritional status. The initial challenge in the diagnosis of bronchiectasis is considering it as an explanation for the presenting symptoms. The diagnosis itself is achieved relatively simply on high-resolution CT (HRCT) scanning of the chest; the subsequent challenge is determining the cause and severity. Diagnostic studies include serological, biochemical, microbiological, radiological and physiological investigations (Table 2). 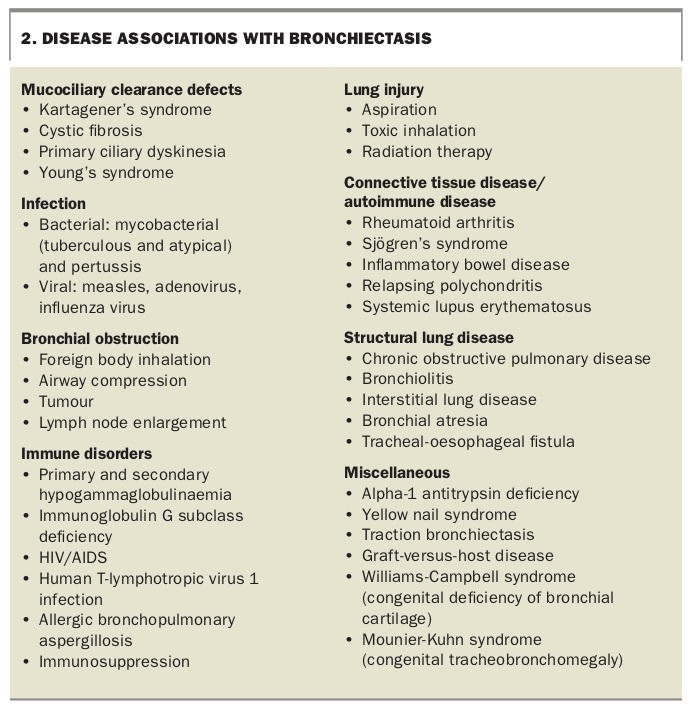 Several aetiological factors contribute in the development of bronchiectasis (Box 2). Identification of these factors has been shown to be important for directing management.16 This is perhaps most evident in immunodeficiency syndromes including antibody deficiency, such as common variable immunodeficiency and X-linked agammaglobulinaemia, for which intravenous immunoglobulin replacement therapy may revolutionise outcomes. Testing for cystic fibrosis and primary ciliary dyskinesia in adults under 50 years of age is beneficial.1 The presence of gastro-oesophageal reflux may be identified using barium or gastrografin swallow imaging. Studies of children and adults show that the identification of a cause leads to a change in management (to disease-specific management strategies) in more than half of patients. 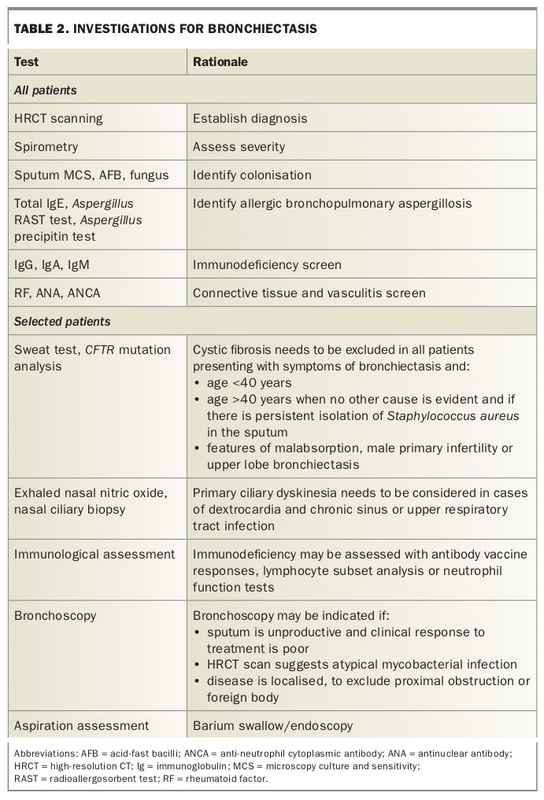 Identifying a cause remains difficult in patients with non-CF bronchiectasis. Even after careful evaluation up to 40% of cases remain classified as idiopathic. 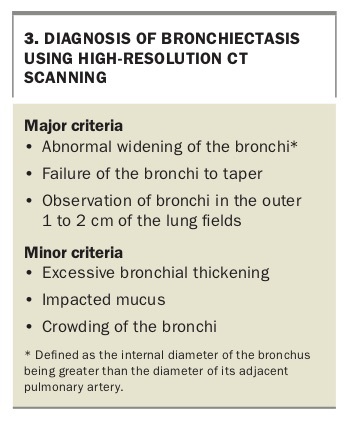 HRCT scanning is the radiological diagnostic gold standard test for bronchiectasis and increased availability has increased confirmation of this diagnosis. The main findings on HRCT (Box 3) that indicate bronchiectasis are abnormal widening of the bronchi (defined as the internal diameter of the bronchus being greater than the diameter of its adjacent pulmonary artery), failure of the bronchi to taper and observation of bronchi in the outer 1 to 2 cm of the lung fields (Figures 2a, 2c and 2d). Multidetector HRCT has elevated diagnostic yield with shorter acquisition times and reduced motion artefact. CT scanning without high-resolution acquisition can either miss or significantly underestimate the presence and extent of bronchiectasis.